Silva will replace Brian LaFountain, who will return to the classroom teaching high school math in Ceres. Recognized retiring employees Mark Ranes (technology director), Ana Rush (account technician), Genaro “Willie” Lugo (utility worker), Maria Gomes (custodian) and Aaron Rosander (superintendent). 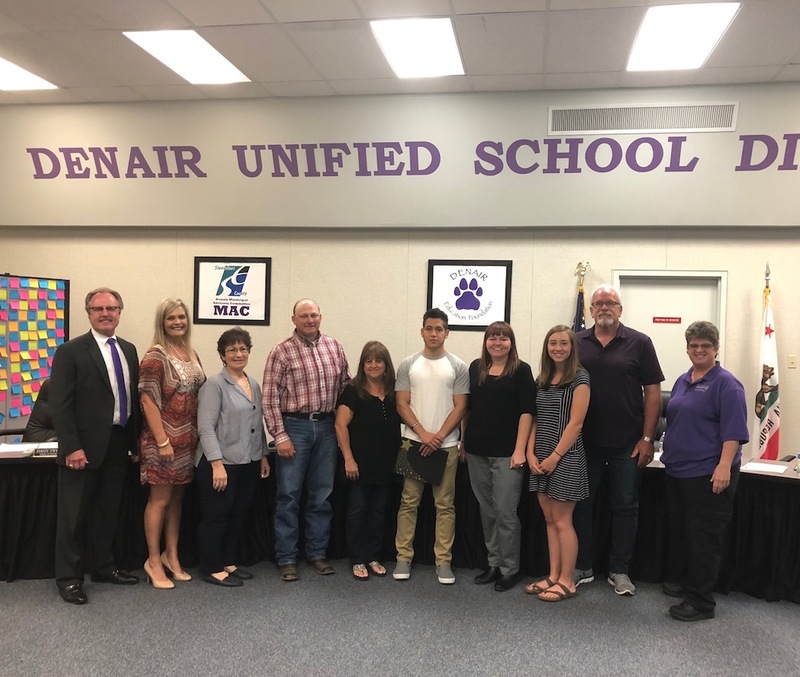 Honored Denair High senior Josue Fierros Avila for transitioning from English learner to English proficiency. Agreed to change the Denair Middle School schedule so it is identical to that of Denair High School. It will allow more middle school students to take high school courses. At both campuses, class will begin at 8 a.m. and school will let out at 2:45 p.m.
Approved changes in agriculture instruction at the high school and middle school. The ag mechanics class at DHS will be modified to meet physical science graduations requirements. An ag construction class will be added, creating a second multi-class ag pathway for students (ag welding and ag mechanics). Also, ag courses will be available to middle school students for the first time. Heard a report and analysis from David Naranjo, senior director of curriculum and instruction, about the state’s new “dashboard” system to measure various educational outcomes by school and district. Listened to a recap from Denair Sports Boosters president Kathy Pritchard about the many ways the organization helps student athletes. It hosts all sports banquets; raises funds for football and baseball equipment; purchased new uniforms for basketball, soccer, volleyball, wrestling and softball; bought patches for letterman’s jackets; paid for the golf team’s greens fees; handed out $3,400 in scholarships; raised $21,000 at its most recent sports auction; and supported football and basketball fundraisers. Its next fundraiser is Saturday’s “Drive One for Ur School” event at Price Ford in Turlock. 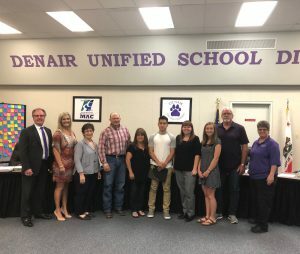 With each test drive of a new Ford vehicle, funds will be donated directly to the Denair High School Sports Boosters, Sober Grad and the FFA Boosters. Posted in News and tagged board meeting, Denair Middle School.